Unlike many floor plans, this charming country ranch lives much bigger than its modest square footage would indicate by employing a cathedral ceiling in the great room and bay windows to maximize light and space. The foyer serves as a central hall, opening to the dining room, great room, and leading to two family bedrooms and a full bath. An open, central kitchen with cooktop island services the great room, breakfast area, dining room, and deck with seating and optional spa area. The master bedroom, located at the rear for privacy, opens to the deck and features a walk-in closet and bath with separate shower, garden tub, and double lavs. 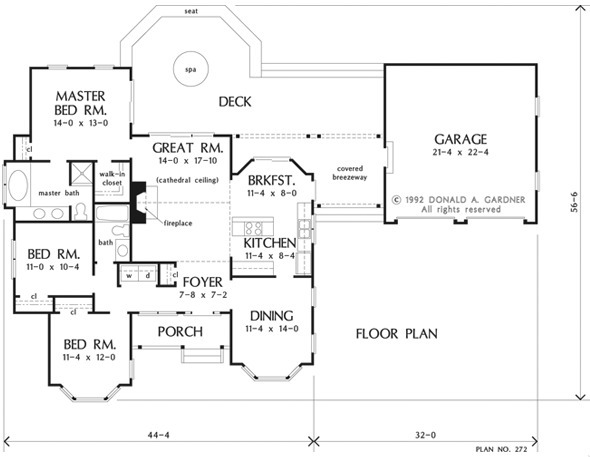 1st Floor: 1445 Sq. 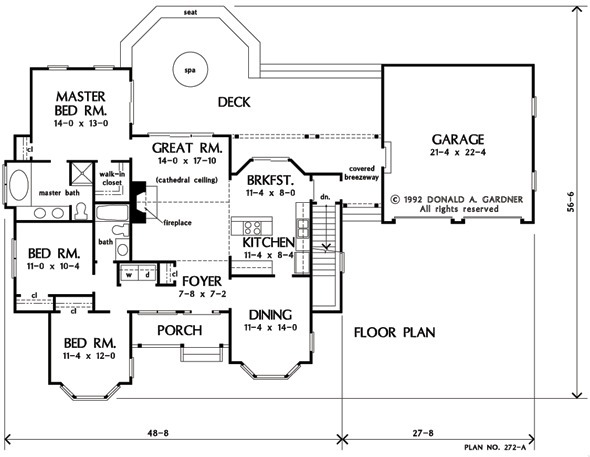 Ft.
House Dimensions: 44' 4" x 47' 8"
Great Room: 14' 0" x 17' 10"
Master Bedroom: 14' 0" x 13' 0"
Foyer : 7' 8" x 7' 2" x 8' 0"
Dining Room : 11' 4" x 14' 0" x 8' 0"
Great Room (Cathedral): 14' 0" x 17' 10" x 14' 6"
Kitchen : 11' 4" x 8' 4" x 8' 0"
Breakfast Room : 11' 4" x 8' 0" x 8' 0"
Master Bedroom : 14' 0" x 13' 0" x 8' 0"
Bedroom #2 : 11' 0" x 10' 4" x 8' 0"
Porch - Front : 14' 0" x 5' 0" x 0' 0"
Deck / Patio : 36' 0" x 9' 8" x 0' 0"
Other : 10' 10" x 10' 5" x 0' 0"